Adobe continues to refine its flagship illustration tool with Illustrator CC 2014, a minor update with just a handful of feature additions. Interestingly, many more new features were introduced to the vector app with the mid-cycle Illustrator CC 17.1 update in January. A number of these earlier additions merit discussion, and combined with the enhancements in CC 2014, they address one of the longest-standing complaints I’ve had with the application. In my past Illustrator reviews, I have consistently lamented the application’s anemic object tools. Select the rounded rectangle tool, click the artboard and you’d be asked to specify the corner radius; once the radius was determined, it was locked in and uneditable. Stretch the object in one direction, and the corners would stretch and distort, too. Similarly, the star and polygon tools provided little in the way of settings, and those too were locked in once set. Creating a star with rounded corners or a polygon in the shape of gear was a logistical nightmare for even the most hardened Illustrator veterans. Illustrator CC 17.1 (released in January) took the first step to addressing this issue. It introduced an incredible feature called Live Corners that lets users round, invert, or chamfer one or more corners of an object at a time. Stars can now have rounded corners with a few simple clicks. 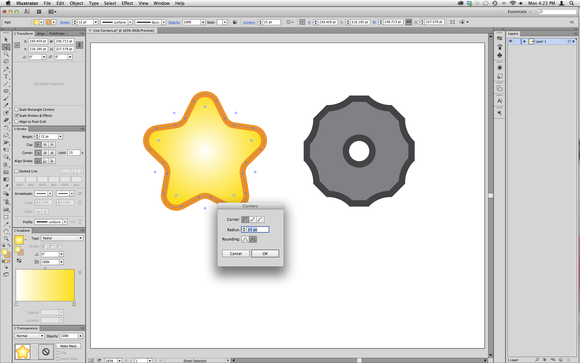 Create a star object and then choose the direct selection tool; when you do, a series of small control circles appear adjacent to each corner anchor. Drag a control circle and all corners in the object will change at the same time; option-click a control circle and the object will alternate between round, inverted round and chamfer corners. Don’t want to apply changes to all corners at once? Just select one or more corner anchor at a time. And Live Corners aren’t limited to star and polygons—any corner anchor in any object can be edited this way, including those in rectangles. Live Corners allow you to quickly create rounded stars and gear-like objects. 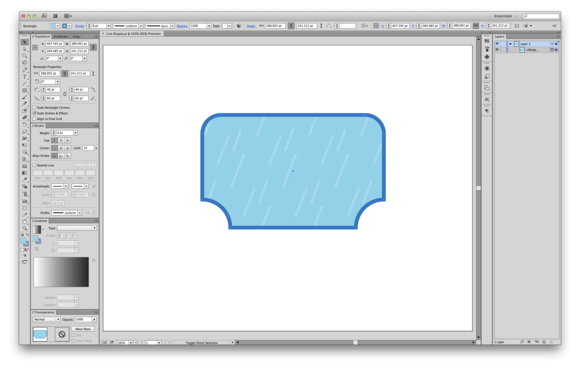 Unfortunately, rectangle corners in Illustrator CC 17.1 were still subject to distortion when stretched. That’s been addressed in Illustrator CC 2014 with a new feature called Live Shapes, which adds a layer of intelligence to rectangle objects. As with live corners, the corners of rectangles can be easily configured with round, inverted round, or chamfer corners of any size, and by selecting a single corner anchor, you can edit each one individually. However, you’re now free to resize, rotate and stretch the rectangle as you wish without distorting the corners. Options in the Transform panel allow you to specify the corners’ radius and shape, and you can also choose whether you’d like the corners to scale when resized. Live Shapes allow rectangles to have consistent, shaped corners that do not distort when resized. The feature is not without caveat. Shear the rectangle or reposition a single corner anchor, and it regresses to a standard object with Live Corners. And for the moment, Live Shapes is a feature that only applies to rectangles, leaving polygons and stars still relatively basic (save for Live Corners enhancements). I look forward to the day when stars and polygons are equally intelligent objects, allowing users to quickly reconfigure the number of points/sides and stretch the objects without corner distortion. The Illustrator CC 17.1 update also introduced a significant and very sensible change to the perspective grid. Previously, an object attached to the grid stayed in place if the grid was repositioned, requiring the user to remove and re-attach objects to the grid to alter the perspective. Now you can lock the Station Point and reposition both the horizon line and vanishing points, and all artwork attached to the grid will change perspective along with it. It’s another small but significant change that lets users make minor changes without a major effort. The Perspective Grid now alters the perspective of attached objects when you change the grid itself. Another series of small but meaningful changes come to the Pen tool in Illustrator CC 2014. The most obvious of these changes is new automated preview. As you lay down anchor points, a blue preview line extends from the most recent point you’ve drawn so that you can see the exact shape of the curve before you drop your next point. Additionally, holding down Command after you drop a point allows you create unequal paired handles, giving you much more control over the shape of an object as you draw. A further refinement to the Anchor Point tool allows you to convert just one side of a corner point back to smooth, a much-needed change that preserves one half of the original curve instead of obliterating both sides. And finally, control handles no longer snap to grid, offering you much more freedom when you must work with grid-based workflows. 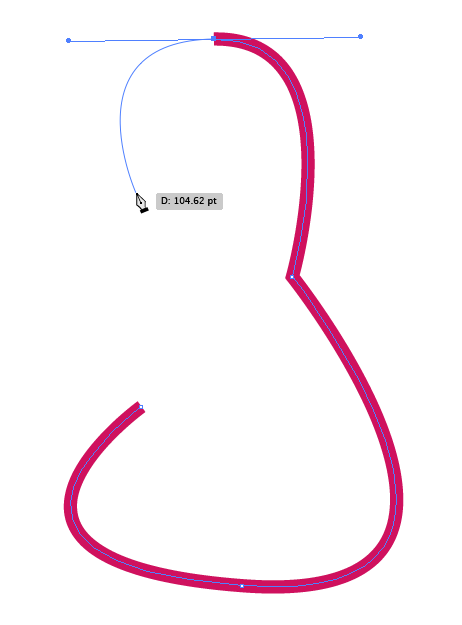 The Pen tool’s new preview feature shows you the shape of the next line segment before you drop the point. One thing that struck me as odd was that Illustrator CC 2014 did not import presets from Illustrator CC, whereas Photoshop CC 2014 offers to import presets from Photoshop CC. So once again the tedium falls to user to bring over items such as Variable Width Line presets and Actions. It was refreshing to see this respect for continuity finally added to Photoshop, and Adobe would do well to add it Illustrator as well. However, it’s worth noting that neither application inherits the workspace layout or preferences of its predecessor. Upon installing Illustrator CC 2014, I was required to rearrange panels and reconfigure settings to match my preferred workspace in Illustrator CC. Given that Adobe allows you to sync many settings via the Creative Cloud, it was disappointing that these were ignored upon the launch of the new app (which is of course tied to the same Adobe ID). Other minor issues persist. Outline mode still presents jagged lines (aliased) rather than smooth lines (anti-aliased), an anachronism in this day in age. Pattern anti-aliasing continues to be flawed, with seams occasionally appearing within Illustrator and when exported to Photoshop. And we’re still unable to choose inside or outside alignment for strokes on text, requiring the user to either layer multiple text objects or convert text to paths for more advanced graphic treatments. Illustrator CC 2014 cannot be considered a major new release, but rather, the continued refinement of a venerable tool. It’s refreshing to see Adobe go back to the basics, upgrading simple shape tools that have been stagnant for over a decade. Usability enhancements to drawing and perspective tools round out this latest revision, and as whole, it feels as though there’s been a shift in focus from headline features to everyday functionality. It’s a welcome change, and the app is better for it. 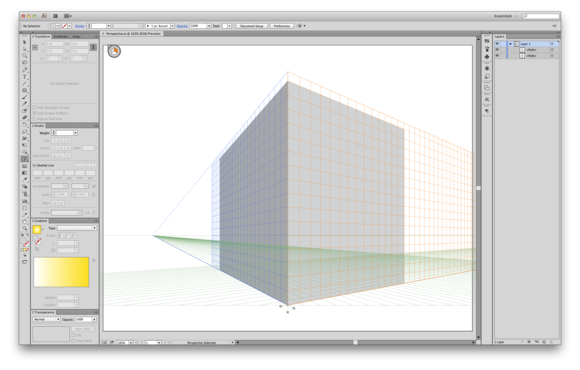 Illustrator finally gets improved shape tools, along with usability enhancements. All in all, Illustrator is a better program than before.